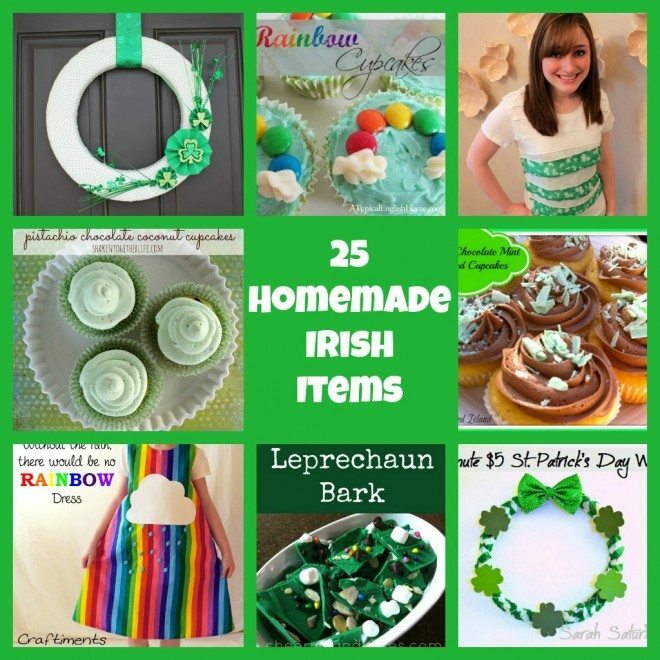 There are just less than 2 weeks until St. Patrick’s Day so here are 25 Homemade Irish Items to get your creative juices flowing. I promise you’ll find something that you love. That is one fun, green round up! Love it! Thanks for sharing my pistachio cookies! Love this compilation! Thanks for including my cupcakes with mint curls Jenny! Awesome round-up … that rainbow dress is so stinkin’ cute! Great collection! Thank you for including my Leprechaun’s Snacks ! It’s crazy right?! The worst part is because Easter is early this year, I’m already wracking my brain for Easter crafts. Thanks so much Jenny for featuring my Coffee & Baileys cupcakes! I feel honored 🙂 Have a great week! Thank you for featuring my St. Patrick’s Day Subway Art. What an honor to have been included amongst so many wonderful projects. Happy Tuesday. So many great ideas Jenny! Pinned! Thank you so much for featuring my printables! Have a great week! THANK you for featuring my Blarney Stones – adding your button to the post! Hope you are well…. Thank you for sharing my “Colleen Hat” stay tuned for the Luck Leprechaun! GREAT round up! Loving that rainbow dress…how cute! This JUST pinged back at me! LOL Thanks for including my creamer!